Published in 1961 and receiving Newberry honors the next year, The Golden Goblet is still a worthy read decades later. Within, young Ranofer wants nothing more than to become a goldsmith in ancient Egypt, but after his father’s death, he goes to live with his horrible half-brother, Gebu, who apprentices him as a stonecutter. After finding an exquisite goblet hidden among Gebu’s clothing, Ranofer is convinced his brother has been robbing tombs in the great Valley of the Kings. But how can he prove it without getting himself killed? Ranofer is a captivating character. Surrounded by wicked men, he keeps his integrity. Among devestating circumstances, he maintains hope. And as he struggles to reshape his life to realize his dreams, this bewildered boy matures into a thoughtful, courageous young man who is willing to risk his life for what he believes is right. And as he does, he is befriended by two companions, young Heqet and the Ancient, who demonstrate true loyalty and friendship. Not only are Ranofer, his friends and Gebu fascinating, their surroundings are beautifully depicted. Ms. McGraw paints for her readers a stunning portrait of the land, its culture and its religion. The Golden Goblet would be a valuable companion for a social studies unit on Egypt. It would be equally valuable in any children’s literature class, as she writes with rare artistry. Her prose is fluent and poetic, and she makes effective use of a variety of literary devices. She’s a master of dialogue. And her choice of word pictures, in particular, are wonderfully rich and period-appropriate. For me, this richness is the book’s greatest strength. While The Golden Goblet successfully held my interest, and it ends with a spine-tingling conclusion, it took a great many slow pages to develop in the middle. Not every reader would stick it out. But in my opinion, it’s worth pushing through. 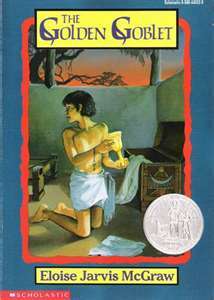 Ms. McGraw has made ancient Egypt come to life and given to us a delightfully innocent, lovable, unforgettable character named Ranofer who, in my favorite scene of the book, is asked by the queen what he would most like in the world and asks for… a donkey! Recommended for ages 10+.